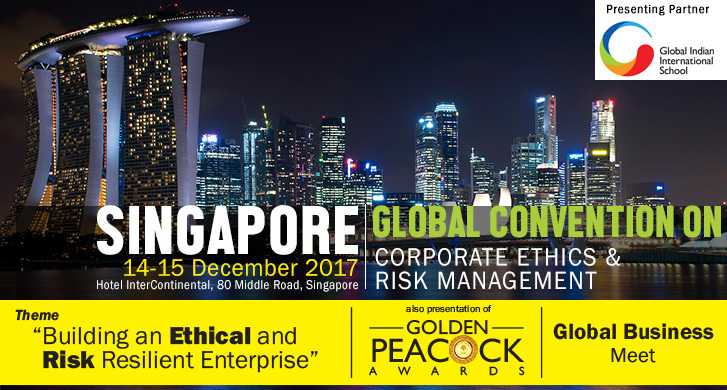 I have pleasure in inviting you to the 'Global Convention' on 'Corporate Ethics & Risk Management', being held on 14 - 15 December, 2017, Singapore. The oversight, understanding and mitigation of Risks in a volatile, uncertain and complex world have never been more crucial. No business transaction takes place without taking risk. Vulnerability is an indication of the susceptibility of organizations, notwithstanding uncertainties in the environment. Following the collapse of corporates like Enron, Lehman Brothers and Satyam etc, the world continues to struggle with the consequences of the first systemic ethical crisis of the Twenty First Century. Yet, larger and potentially more harmful risks are lurking. These include climate change, fragility in global supply chains and cyber threat and impact across an organization in a way that most 'traditional' risks cannot. Also important is the collective impact of social media, and a 24/7 news cycle, which can turn a very small event into a rolling national and international story. 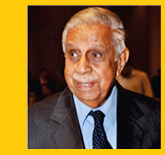 Sustainable growth can be ensured only through good governance and proper risk management. Risk management is no longer discretionary. Risks can come from uncertainty in financial markets, project failures, legal liabilities, credit risk, accidents, natural causes and disasters, as well as deliberate attack from a competitor or uncertain or unpredictable events. Enterprise-wide Risk Management (ERM) approach has encouraged organizations to build a comprehensive risk strategy into their business operations. ERM is increasingly being seen as the preferred approach to risk management, as it is strategically focused and comprehensive. Implementing ERM is an ongoing journey of organizational development, through resilience and leadership for sustainability. The reason for selecting Singapore as the venue is the unprecedented business opportunities offered by this global financial capital. The Convention will provide a platform to interact with movers and shakers, and top risk management professionals. IOD, India looks forward to welcoming you, at this special Global Convention.